Was the "serpent" actually a serpent before he was cursed by the LORD God? Mostly everyone is familiar with the "serpent" who is introduced to the story of Adam and Eve in Genesis 3. I wonder if he was actually a serpent, in the way we think a serpent to look, before he was cursed by the LORD God. My first reason for pondering this is because the serpent talks. He smooth talks Eve into partaking of the fruit of the tree of the knowledge of good and evil. Serpents don't talk. After he is cursed by the LORD God, there is no more dialogue from the serpent. He doesn't say, "Oh shoot! I've been cursed." The only other time in the Bible when an animal talks is in Numbers 22:28, and that was only through the Lord's power. However, anything can happen in a piece of literature. Good grief, if Harry Potter can fly and make magical things happen with a flick of this wand, I think a serpent can talk. Next, and more legitimate, is my second reason. When the LORD God curses the serpent, he says, "Because you have done this... on your belly you shall go, and dust shall you eat all the days of your life." Why would he curse a creature already on his belly to be on his belly for the rest of his life? That would hardly be a curse at all. This observation of Genesis leads me to believe that the serpent wasn't a serpent before he was cursed. But, let's see what some sources have to say. Scholars Matthew Poole and John Calvin, both found here, differ in their arguments. Poole is in favor of the change. He says, "If the serpent did [slither] before the fall, what then was natural is now become painful and shameful to it, as nakedness and some other things were to man. But it seems more probable that this serpent before the fall either had feet, or rather did go with its breast erect..." Calvin, rather, believes that the serpent was simply confined or condemned to his current state as punishment for attempting to rise up against man and exalt himself. In his sermon preached on September 28, 1958 (which can be read here), William Branham states, "...he was the smartest thing there was, and the more like the human being than anything else that was on the field: closest to a human being. He was not a reptile. The curse made him a reptile." Again, this idea makes the most sense to me because the curse wouldn't have been a curse at all if the creature remained in the same condition. In condordance with Branham's statement that the serpent was the smartest (trickiest) thing, Dictionary.com defines serpent among other things as "a wily, treacherous, or malicious person. The Devil, Satan." Also echoing this concept is Nelson's New Illustrated Bible Dictionary, which says that the serpent is "...often associated in the Bible with temptation, sin, and evil." 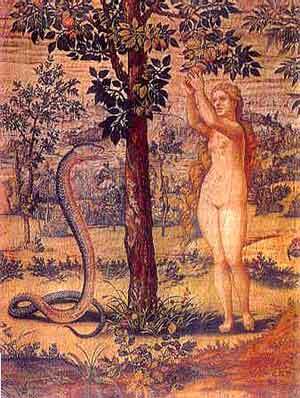 Artists definitely have their own opinion of how the "serpent" looked as he was tempting Eve. Was he an upright snake as seen below? Perhaps he was half snake and half man. Or, maybe he was this lizard-man-dwarf type thing, which personally creeps me out. (b) a serpent before he was cursed, only now he his sentenced to that state forever with no chance of escaping the serpent state? Perhaps you made a third option "c" which is "I can see it either way" or "I have another idea of what might have occurred." If you have another idea, PLEASE comment and ellaborate. I'd love to hear your responses and ideas. As for me, it makes more logical sense for the serpent to have been something other than a snake before he was cursed since the LORD God clearly put him on his belly. It is possible that the story is metaphorical and that there was not a literal serpent. The device illustrates a question that comes to all of us, "Can we know better than God?" The serpent came with a plausible argument that there was some good fruit, and maybe a way around God's rule somehow. Why would God care if she had the beautiful, delicious fruit? Eve's self deception is ours. We want power and we want to be God. Add Adam to the mix, and we have the human condition in a nutshell and the tension within all human relationships explained. The story beautifully sets out two basic truths... (1) we know the right things to do, and (2) we don't want to do them. Good point, Ms. Case! Perhaps the "serpent" was merely the temptation itself. I thought about that as I was composing the blog but didn't include it for two reasons: (1) because I didn't find a source on it; it was just my own thinking, and (2) the concept didn't make sense when it came to the curse. Why would a temptation be cursed to its belly? I probably should have included it in the post anyway. Coincidentally, another classmate posed the same question, and we later talk about this same idea. Thanks for the thoughful and insightful comment! And yea, that lizard man dwarf is totally creepy. As usual, great post, Katie! Jan, come and play in our class, please??? We have a great group again this semester, and I love how your "mathy but not really mathy" brain works! Haha. I would love to come play in your class sometime. And I think I'll include "mathy but not really mathy" in my Digital Measures descriptions. Very interesting points. Before stumbling here I decided to go around and do some research and I have come to see that there could be a slight chance that this creature did not only have legs, but wings. I know I read somewhere about the fiery serpents used by God, but, could there be a possibility that these creature was a former worker in the heavens like the Cherubim? That he had wings that took him to and fro heaven and earth and could it just be that satan decided to use a creature that Eve would recognize and trust, one that had to be known as close enough to the Father? Why would ugly creepy things exist in the beautiful garden of eden? Was temptation crouching at their door?